Maybe it’s the elaborate presentation but chocolate and Valentine’s Day go together like pumpkin pie on Thanksgiving or champagne on New Year’s. It’s a celebration treat doled out with love, affection – and sweetness. The magic ingredient in dark chocolate is flavanols — a naturally occurring substance found in plants that boost chocolate’s antioxidant action. These antioxidants help defend our body’s cells against damage caused by free radicals formed through normal body processes, like breathing, or they protect cells from environmental contaminants like cigarette smoke. Antioxidant-rich flavanols are concentrated in raw cacao beans – the basis for all things chocolate. Some studies suggest chocolate may lower blood pressure, improve blood flow, lower cholesterol and help with insulin regulation. Bailey shares these tips to make informed choices about chocolate temptations. The more processed the chocolate, the less of the heart-healthy ingredients. The higher the cacao, the lower the sugar content. Keep servings to half an ounce or one ounce to prevent weight gain. Most chocolate products are high in sugar, fat and calories and can have harmful effects on the waistline. Check labels for calorie counts and serving sizes. A typical chocolate bar contains 200 to 300 calories. 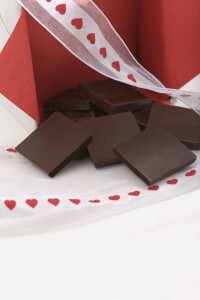 While dark chocolate offers a way to satisfy your sweet craving with fewer calories, remember that one piece of premium chocolate in that Valentine’s Day heart-shaped box can still have up to 70 calories. “Moderation is always key,” Bailey added.